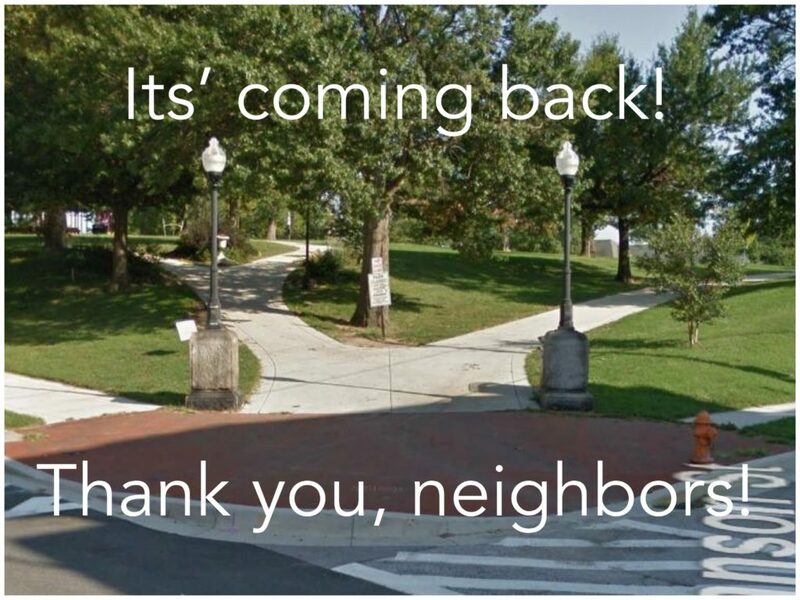 After a meeting with the Deputy Director of the Department of Transportation (DOT) on the traffic calming project, we are happy to report that the brick entrance to Riverside Park will be restored! Thank you all for your advocacy! The entrance had an issue of non-compliant slope and color contrast on the ramp. This situation was never properly relayed between DOT and the community. To make the entrance ADA compliant, there will be a yellow textured ramp within the brickwork. There is no timeline for restoration, but DOT is finally aware of the community’s preference for brick and will restore it. The Baltimore City Department of Transportation made an error by removing the beautiful brick entrance to Riverside Park at the corner of Randall St and Johnson St. 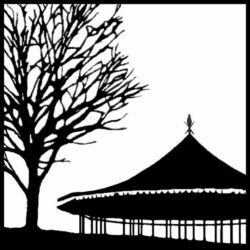 While the RNA Board has been working closely with Councilman Costello since October 27 to remedy the situation, the Department of Transportation and the Department of Recreation and Parks have not been responsive to our requests to restore the brick entrance that welcomed residents and visitors to our historic park. The Department of Transportation stalled the current traffic calming project for nearly five years and then upon execution and without notice, replaced brickwork that posed no problem and was not a part of disclosed plans, and then cited false reasoning for their actions. 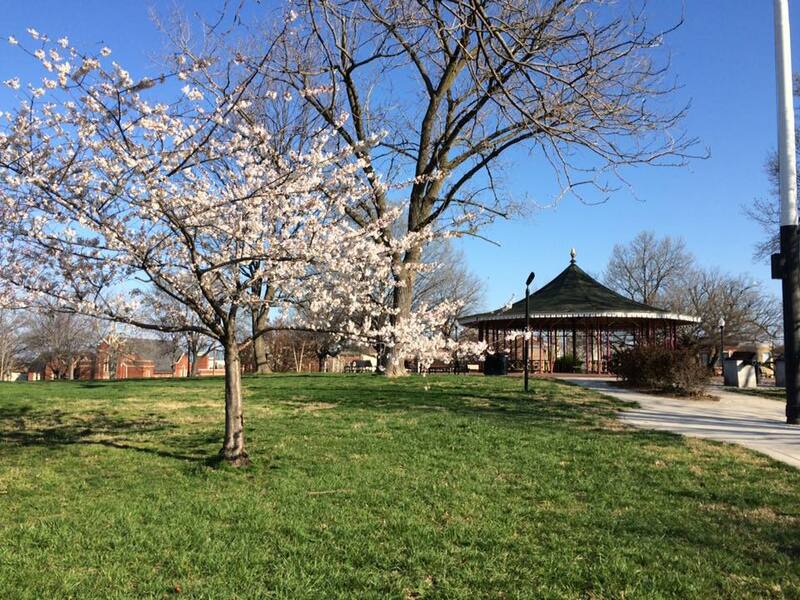 We take great pride in our historic park, and spend nearly all of the money we raise and countless volunteer hours to maintain and beautify our neighborhood gem. We hope that you will take a few moments of your time to help us hold the Department of Transportation accountable for this error and prevent them from continuing these actions on our other brick entrances. *Detailed information is presented below the contacts to provide you with more background. Please email and/or call each of the following parties at your earliest convenience using the suggested text or that of your own to demand that our park entrance be restored to the beautiful brick that was recently installed in 2012 as a way to further beautify our park and celebrate its place in history. Riverside Park is the cornerstone of our community. This historic park is where we gather for concerts, sports, summer play, and winter sledding. It is where we exercise and take leisurely strolls with our dogs, family, and friends. 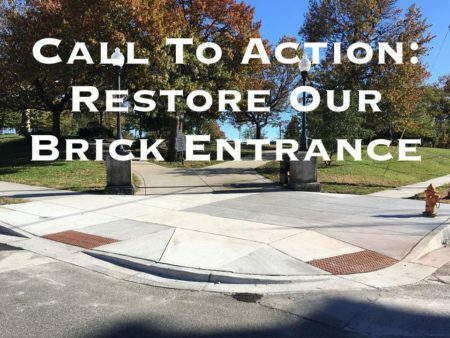 We demand that you work to quickly restore the beautiful brick entrance at Randall St and Johnson St so that we can continue to fully enjoy and take pride in our neighborhood park. Riverside Park is the cornerstone of our community. This historic park is where we gather for concerts, sports, summer play, and winter sledding. It is where we exercise and take leisurely strolls with our dogs, family, and friends. We demand that you advocate for our community to the fullest extent to ensure that the Department of Transportation quickly restores the beautiful brick entrance at Randall St and Johnson St so that we can continue to fully enjoy and take pride in our neighborhood park. Riverside Park is the cornerstone of our community. This historic park is where we gather for concerts, sports, summer play, and winter sledding. It is where we exercise and take leisurely strolls with our dogs, family, and friends. We demand that you work with the Department of Transportation to quickly restore the beautiful brick entrance at Randall St and Johnson St so that we can continue to fully enjoy and take pride in our neighborhood park. Prior to 2012, Riverside Park’s corner entryways were concrete ramps, and the gazebo entrance was a hatched concrete design. 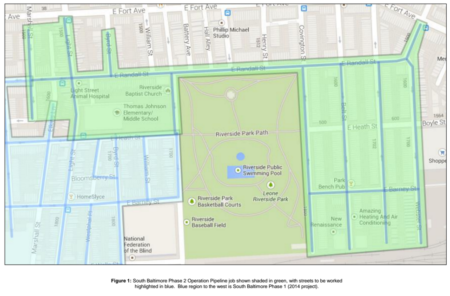 The brick entrances the community has known since then came about after the Department of Recreation and Parks and the Riverside Neighborhood Association (RNA) met to discuss park improvements funded by the City’s capital budget. In order to make the entrances less road-like and more pedestrian friendly, they decided on an aesthetically pleasing brick design that would bring historic character to the park in preparation for the 2014 Bicentennial celebration. The park corners would become pedestrian-friendly, ADA-compliant bump-outs that would deter unnecessary vehicular traffic, yet still withstand the weight of large vehicles such as the trash trucks that enter the park almost daily. The gazebo area would also be redesigned with bricks to match the three Randall Street entrances. The Riverside Neighborhood Association and park patrons were very pleased with the renovations, and several neighborhood volunteers continued to spend their time improving entryway gardens and working on other beautification projects within the park. 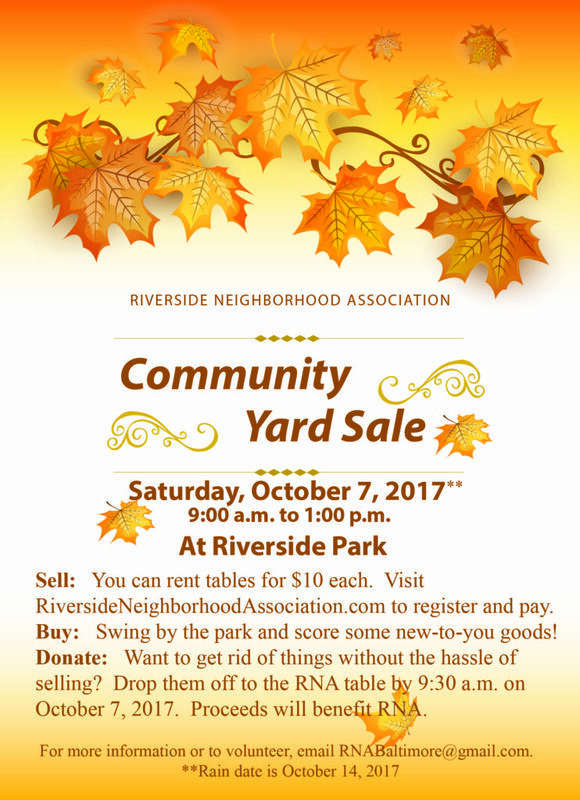 The Riverside Neighborhood Association believes the Department of Transportation made an error that they fail to recognize as such, and are instead issuing false statements to justify their actions. RNA believes that the brickwork previously in place was laid in plane, and therefore would not produce rolling resistance or subject pedestrians on wheels to the stressful or painful effects of vibration. The brickwork did not have the same effects as cobblestones or Belgian blocks mentioned in this guideline, and the use of brickwork around the park was reserved for decorative accents that occasionally cross the pedestrian access route. Riverside Park corners were in total compliance with the cited guidelines, and therefore we strongly urge you to reach out to those mentioned in our call to action to correct this mistake. 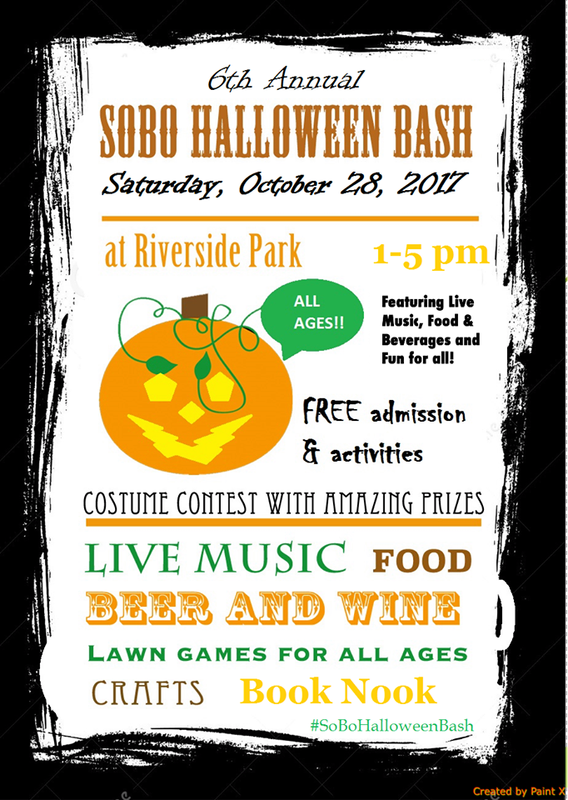 Join friends and neighbors for this spooktacular family-friendly event at Riverside Park. Stay up to date by RSVPing to the Facebook event. Please consider a tax-deductible donation to this completely volunteer-run event. Any amount is greatly appreciated! Limited tables available for day-of registration! Scroll down to register now to save space for your own tables, or borrow ours. The reservation fee is the same whether you’re bringing or borrowing. 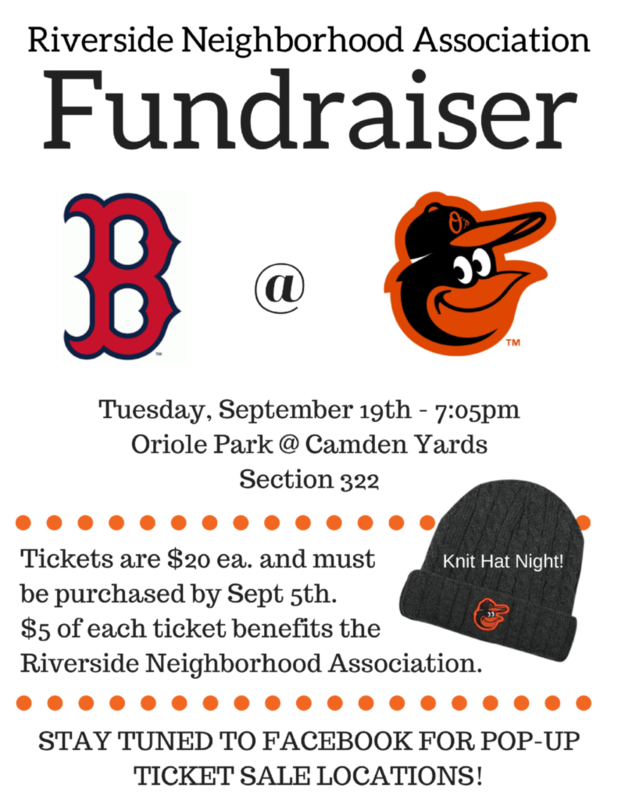 All profits from this event benefit the Riverside Neighborhood Association. Don’t forget to follow the event on Facebook for updates, and share it with all of your friends! *If you ordered tickets on our website, please email RNAtreasurer@gmail.com to arrange pickup. Check our Facebook page to find out when and where we will be selling tickets! Sell: Online registration is now closed. There may be tables available the day of for $15, but this is not guaranteed. You are welcome to bring your own table and pay $15 for the space as well. Please email rnabaltimore@gmail.com for more details. 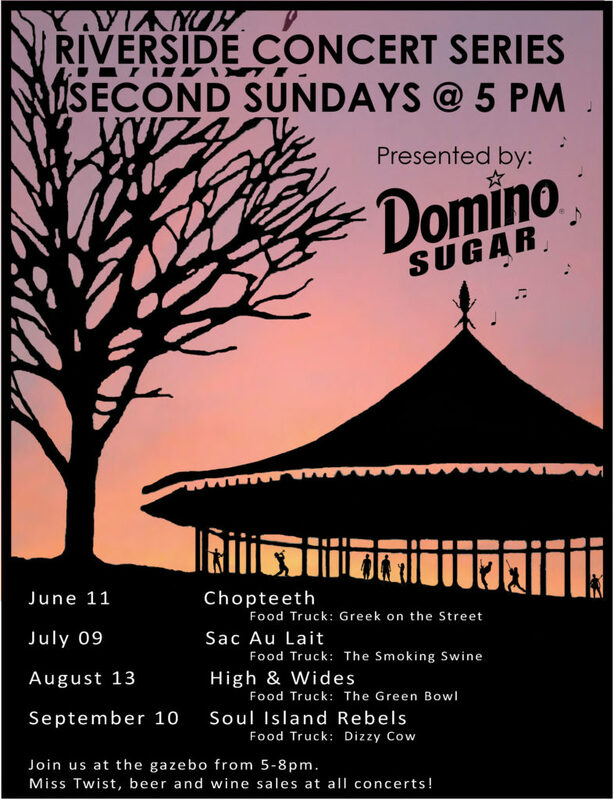 Buy: Swing by the park and score some new-to-you goods while enjoying Riverside Park. Donate: Want to get rid of things without the hassle of selling? 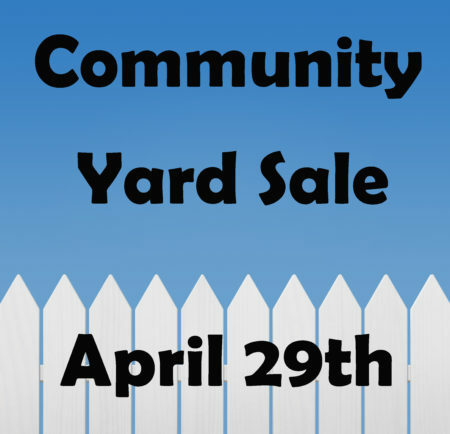 Drop them off to the RNA table by 9:30 a.m. on April 29. Proceeds from your donations will benefit RNA. For more information or to volunteer, send an email to RNABaltimore@gmail.com. 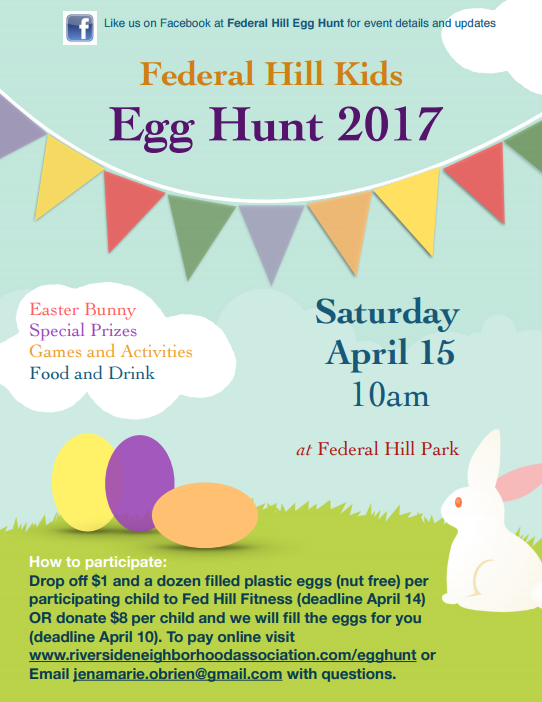 Be sure to follow the Egg Hunt on Facebook for the most up-to-date information! *Online payments are now closed. Note: There may be several updates this month and in the months that follow. We will begin to reference the phase in the title of each post (since we will be involved in multiple phases quite soon), and the update number will signify the month of work (3), followed by how many updates have been released each month (1 so far). Update as of 8/14/17: Check Facebook for the latest updates. BGE is ramping up to complete all service work on this Phase II (green shaded streets) project by the end of April. Final paving restoration will start in April and likely go through about July. The existing cast iron gas main will be abandoned in place in two (2) separate abandonments. The first abandonment is tentatively scheduled for end of March, the second for end of April. It’s important for residents within the first abandonment area (green shaded area east of Riverside Ave) to be transferred over to the new gas main by end of March or risk getting their gas service cut off. The same goes for residents in the second abandonment area by the end of April (green shaded are west side of Riverside Ave). Some residents have been told that they have until the end of April to schedule work. This is incorrect information and BGE is correcting this with Willbros. You must respond to the hangtag and/or phone calls from Willbros/BGE as soon as possible. Residents risk service cut-off if they refuse entry to replace gas line. As of 2/21/2017 there were 270 residences still in need of replacement. Once they start the new gas pressure, it absolutely cannot run through an old line, which is why BGE will need to cut off your service if the transfer does not happen in time. If you schedule an appointment and workers do not show up, please report details to BGE (operationpipeline@bge.com) and to RNA (rnabaltimore@gmail.com). The line must be accessible at its entry point, even if that is 3 or 4 feet from the meter. Residents are responsible for cost of drywall repairs if drywall has to be removed for replacement work. The workers may come into your home a few days prior to look at space and determine with you if any part of wall needs removal. They do not tend to bring floor/furniture/wall covering in, so we suggest putting down tarp or sheets on the floor if you have a finished basement. Willbros has increased to 5 crews in the neighborhood working daily. This means that from 2/21 until the work is completed, blocks will be closed and sometimes both one way streets may be closed at same time. (ex. both Belt and Webster could be closed on the same day) It was once told to us that this would not continue to happen, but in order to finish Phase II on time, this will unfortunately be necessary from time to time. Residents may need to use alleys to get to desired location. Alleys seem narrow but if trash trucks fit, cars and trucks will fit. NEVER drive the wrong way down a one way street. At worst, residents may need to park and walk a block and come back for the car later. Soon after an entire block of service installation is complete, sidewalk replacement will begin. Phase 2 (green) is nearing completion. Residents have been connected to the new gas main or will be in the near future. Once all homes are connected, plans will be made to repair disrupted sidewalk squares and repave streets. Phase 3 (blue) residents may have received a letter in the mail or a door hanger to alert you of what is to come. If you attended our last meeting, you were able to hear BGE’s plan and ask questions. If you missed out, the video below also provides a good visual for what you can expect, and you can find FAQs here. 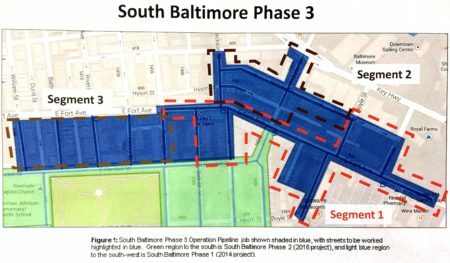 If you still have questions, please email operationpipeline@bge.com or call 410-470-7700 and referece the South Baltimore Phase 3 Project. At this time (Jan 12, 2017), steps 1 – 5 are complete. If BGE has not yet contacted you (or your neighbor with whom you share a pipeline), they will within the next few weeks or months. You will likely find a door hanger on your door or in your mailbox, to which you should promptly respond. You will be asked to schedule a day for BGE/Willbros contractors to come into your home and perform necessary work in your basement. You should plan to be home for the entire day. After all homes within the Phase II boundaries are complete, sidewalks and streets will be restored. This work is expected to wrap up in the spring. All resident questions can be directed to Jimmy McCune at 443-463-0630. Customers are required to provide BGE with unobstructed access to its equipment. This includes all piping up to and including the gas meter inside your home.